Depression has been tied to a variety of physical ailments, from sleep problems to weight loss and weight gain. But when was the last time you paid your dentist a visit? New research adds another potential link to depression: Dental trouble. 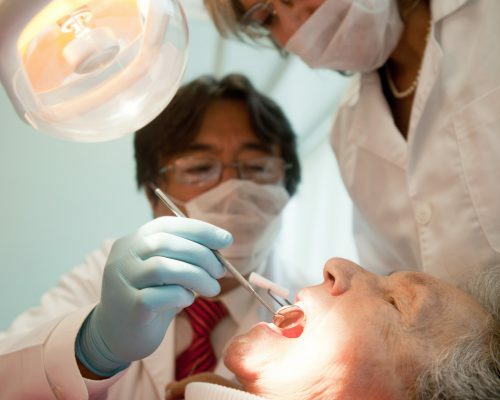 Problems like cavities and gum disease often are associated with bio-social conditions like depression and anxiety, according to new research presented at the 43rd Annual Meeting of the American Association for Dental Research. The findings show that oral care and mental health can be tied together. No wonder ill-fitting dentures or a bad toothache leave you feeling down and out (and you’re giving your spouse the stink-eye for no reason). Researchers from the University of West Virginia looked at 2010 data from the Behavioral Risk Factor Surveillance System Survey, a telephone survey conducted with the Centers for Disease Control and Prevention (CDC) and state health representatives. They interviewed more than 450,000 respondents over the age of 19 who answered questions related to depression, anxiety and tooth loss. Of those participants, 13.4 percent reported anxiety, 16.7 percent reported depression, and 5.7 percent reported tooth loss. The researchers found that depression, anxiety or the two together were significantly associated with tooth loss when compared to survey respondents without those mental health conditions. Anxiety is a big reason why people won’t go to the dentist, and dental anxiety is a recognized phobia that is considered relatively common. The European Journal of Oral Sciences studied the top phobias of people with pre-existing anxiety issues. Of the sample group of 1,961 men and women from the ages of 18 to 93, dental phobia and anxiety surrounding a trip to the dentist was the most common (3.7 percent), followed by height phobia (3.1 percent) and spider phobia (2.7 percent). Women were most likely to experience dental phobia or anxiety. Of course, mental illness itself presents health risks. Untreated depression increases the chances of drug and alcohol addiction, and can lead to difficulty recovering from health problems, insomnia and even suicide. Anxiety is no picnic, either, leading to possible stomach problems and panic attacks, as well as increased risk of other diseases. But oral health can also have an effect on overall well-being. According to Health Canada, pregnant women with gum disease may have a higher risk of delivering pre-term babies. The health agency also says that inflammation caused by gum disease can affect the nearby bones; infections in the teeth and gums can spread to other parts of the body. Untreated gum disease can exacerbate existing lung problems or increase the risk of new ones, and diabetics with gum disease have a higher risk of complications. This new research highlights what can be done in screening for both mental illness and oral care issues. Patients in treatment for mental illness could be screened for gum disease and other dental health problems, and receive help before tooth loss occurs or further issues develop. Screening can go both ways, you just need to make the request of your care provider. People who experience tooth loss and other serious dental problems could be screened for mental health, in the hopes of treating a condition that may affect their oral care. Point being, see your doctor and your dentist if you have concerns. Don’t let misery get the better of you!